One of the more difficult aspects of playing goalie is to stop or play the puck effectively with just one hand on the stick. This skill takes both the strength to be able to control the stick, as well as the security of having a blocker that allows the goalie to deflect the puck effectively. And, with the emphasis put on goalies both shooting and passing the puck these days, it’s important to have a blocker that fits as it should. Like most goalie equipment, blockers come in one of four sizes: Youth, Junior, Intermediate, and Senior. In all four cases, the size of the blocker board correlates directly with the size of the palm on the glove. So, if you purchase a Junior sized blocker, you get a Junior sized palm. With this in mind, blockers should be purchased based on the fit of the goalie’s hand to the palm of the glove. To find your size, measure your hand from the heel of the palm to the tip of the middle finger, then consult the chart below. Length (in.) 4 3⁄4 - 5 5⁄8 in. 5 5⁄8 - 6 1⁄4 in. 6 1⁄4 - 7 in. 7 - 8 3⁄8 in. When fitting your hand to the palm of the blocker glove, we recommend that there be no more than 1/4 inch between the tip of the goalie’s finger and the top of the finger stalls in the glove. Any more room will not allow the goalie to grip and control the stick properly, and will cause the blocker to tilt or wobble on the goalie’s hand when holding the stick. As a guide, the cuff of the blocker glove should extend one to two inches over the bottom of the arm protection on your chest and arm pads. Also, most players don’t like gloves that fit so snug that their fingers feel cramped, so make sure there is a little wiggle room. Make sure you know which hand you hold the goal stick with. Of course, this isn’t too much of an issue when buying gloves in a store, but it is necessary to specify this information when ordering online or over the phone. Regular Blocker Gloves are worn on the RIGHT hand. 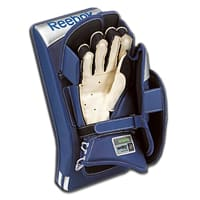 Full Right Blocker Gloves are worn on the LEFT hand. Blockers vary in the amount of finger protection they provide. When looking at the glove part of the blocker, it is important to make sure it provides enough protection. Furthermore, the index finger is the most vulnerable because of the way that goalies hold their sticks (with the index finger pointing straight down the paddle as the other fingers are locked around the shaft of the handle). Because of this, the finger padding is designed to protect the fingers while holding the stick. While in the butterfly position, the blocker is often angled to deflect pucks to the corner, thus leaving your wrist open to pucks. 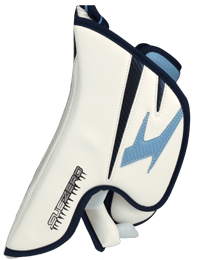 Because of this, most blockers feature an inner padded side deflector that protects the inside of the wrist as well as creates an additional blocking surface. Some blockers vary in the degree of curve. There is a curve at the top of the blocker that helps deflect pucks forward or upward, rather than backwards into the goal. Some goalies prefer larger curves as opposed to smaller ones. However, with the NHL’s new size limitations, most blocker curves are fairly similar. This position gives the blocker a very “balanced” feel over your hand, and it is a good choice for goalies who like to play a “paddle down” stance when pucks are around the net. This position places the blocker board at a forward of center position by approximately ½ -2 inches. The extension of the board in a forward direction “extends” the reach of a goalies arm, allowing him or her to reach shots with the tip of the blocker that they otherwise would not have reached. “Paddle Down” play may be a bit more difficult with these types of blockers. Use a Stick and a Chest/Arm Protector When Picking a Blocker Given the differences in the construction and protection of today’s blockers, it is important that the goalie try them on using both a goalie stick and a chest and arm protector. Why Use a Goalie Stick? Different palms, inside wrist protection, and finger protection will affect the way the goalie holds his/her goal stick. By using a stick in the fitting process, the goalie can easily pick the glove that feels and works best for his or her style. Why Use a Chest & Arm Protector? 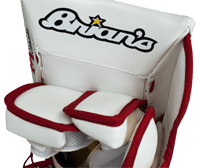 Differences in blocker board position and the cuff of the glove (the insertion area of the hand into the blocker) will affect how the glove works with the goalie’s chest and arm protector. It’s always a good idea to try the two pieces of equipment on together to make sure that they will work together well.